[tile:9401416]'s highlight-reel goal lifted Japan to a 2–1 victory over Netherlands and an appearance in the Women's World Cup quarterfinals. VANCOUVER, British Columbia (AP)—Mizuho Sakaguchi scored what turned out to be the deciding goal in the 78th minute on a pretty left-footed shot from the top of the 18-yard box, and defending Women's World Cup champion Japan held off a late attack to beat the Netherlands 2–1 on Tuesday night and reach the quarterfinal. 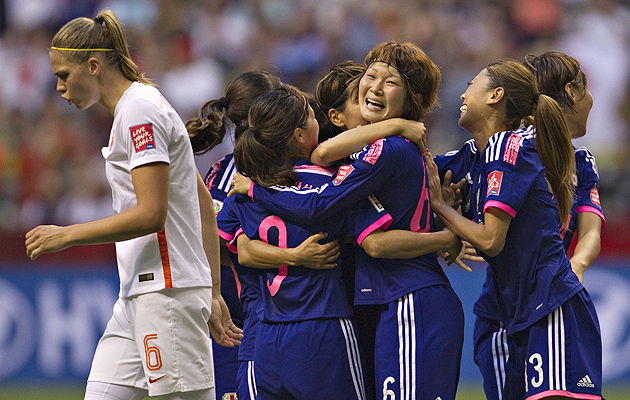 Kirsten van de Ven scored for the Dutch in extra time when the ball went off goalkeeper AyumiKaihori's right arm. Three additional minutes were added to the clock. The goalie put her gloves to her face in disbelief and said something to herself. Sakaguchi scored shortly after Japan nearly had an own goal. Sherida Spitse took a corner in the 76th and the ball deflected off Aya Sameshima toward her own net when Kaihori punched it away with her right fist. Saori Ariyoshi found herself in perfect position when the Netherlands flubbed a clear and scored from the top of the box in the 10th minute for Japan's initial goal. Japan overpowered the young Dutch squad for much of the evening at BC Place by controlling possession in the midfield to create chances, and the defense pushed far up the field. The Nadeshiko, who along with Brazil were the only teams to win all three group-stage games, advance to the quarterfinal against Australia on Saturday at Edmonton's Commonwealth Stadium. They stuck with their familiar World Cup trend, too. Five of Japan's six goals have come in the 29th minute or earlier, and all six have been scored by a different player. Japan, with its hustle and fancy footwork on display for a crowd of 28,717, ran its game plan with precision to control all of the field against an overmatched Netherlands team making its World Cup debut. On the early scoring play, Aya Miyama dribbled down the left sideline and crossed to Yuki Ogimi, whose header hit the crossbar and Dutch defender Merel van Dongen couldn't clear the rebound. Ariyoshi then connected from about 15 yards out and put the ball in the lower corner past diving goalkeeper Loes Geurts. Japan had another solid chance in the 22nd minute on a pretty give-and-go from Sameshima to Shinobu Ohno that Sameshima struck over the bar. Ohno also missed an open header moments before the first-half whistle. Even when the Netherlands threatened early, it seemed a step slow. Manon Melis took a great ball in the seventh minute but couldn't get a foot on it, whiffing as she knocked it out of bounds. In the 48th, 18-year-old forward Vivianne Miedema got the ball near the top left corner of the box and opted to dribble into traffic rather than take a quick shot. The Dutch missed making contact on two headers from the same ball high in the box in the 73rd minute. Japan started three different goalkeepers in the group stage as part of coach Norio Sasaki's liberal substitution plan to use his entire roster and have every player ready to contribute. Sasaki went with Kaihori, the only one to give up a goal in the group stage in a late score by Cameroon in Vancouver. Kaihori made another save in the 86th minute Tuesday. Japan's Homare Sawa, playing her sixth and final World Cup, entered in the 80th minute after starting two of the team's three matches in the group stage. The Netherlands missed a chance to qualify for next summer's Rio de Janeiro Olympics as one of Europe's top three teams, but could still earn a berth into the 12-team Olympic field through a European playoff. The white teddy bear wearing an oversized No. 7 jersey that Japan keeps close to honor injured teammate Kozue Ando held its spot on the bench. Ando broke her left ankle in the World Cup opener against Switzerland in Group C play when she got caught up with Swiss goalkeeper Gaelle Thalmann and left in the 32nd minute. Japan returned to BC Place for the third time in four matches at this World Cup, having also beaten Switzerland and Cameroon in Vancouver.